The Exchange for Women’s work was closed the entire month of August for a major renovation that sprung from the simple desire to get rid of some worn carpeting. The building that houses the Exchange, owned outright by the non-profit it houses, retains its original charm, but the checkout register has been moved from a small room off the back of the store, to the main room. The counter sits atop pretty beadboard. Other improvements include a new upstairs bathroom and improvements to windows and floors. Each time an independent business on Greenwich Ave or its environs succumbs to the pull of the chain store, Greenwich heaves a collective sigh. 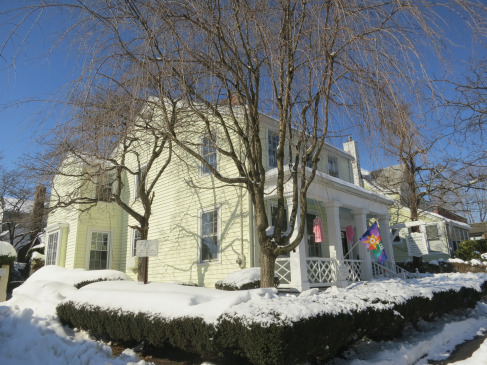 But while house after historic house in Greenwich falls prey to the wrecking ball, the charming house at 28 Sherwood Place, built in 1900, takes on increasing significance as it stands defiantly, frozen in time. While many Greenwich residents speed along Sherwood Place, a shortcut connecting Putnam Ave to Northfields and points north, the charming house that is home to the Greenwich Exchange for Women’s Work may feel like part if the furniture — invisible until it’s gone. Over the years, the Exchange, where 200+ artisan-consignors receive 67% of the selling price for their wares, survives primarily through word-of-mouth. And it helps that the building is owned outright by the non-profit it houses. Surely Luca Gabriele of the adjacent Church Street Gabriele’s Italian Steakhouse that bears his name must ogle the property enviously as his business continues to expand. 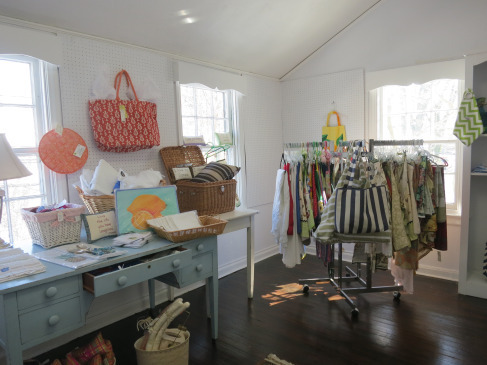 Yet the Exchange not only provides a retail venue for vendors who consign their crafts and wares, but to the uninitiated, the enterprise is a reliable resource for thoughtful, one-of-a-kind gifts. Modestly priced, the handmade gifts defy the imagination, filling room after room with options displayed attractively and without clutter. The Greenwich Exchange for Women’s Work is a non-profit organization whose mission to support the art of handcrafted items by providing a marketplace for talented artisans-consignors. Our 200+ consignors receive 67% of the selling price, with the remaining 33% used by the Exchange for operating expenses and local charitable contributions. The Exchange is managed by a volunteer Board of Directors, who also volunteer alongside our staff in our shop year-round and at our Christmas Fair at the Round Hill Club in November. The first Woman’s Exchange opened in 1832 in Philadelphia to provide a shop where “genteel poor” women could earn money by consigning their home-made, hand-crafted items to the Exchange’s shop. The founders/managers of these early Exchanges believed in this type of self-help philanthropy and encouraged the entrepreneurship of their consignors. Operating as a unique segment of local economies – one that combined charity and commerce – the Woman’s Exchange movement spread rapidly in the decades after the Civil War and shops were now open to consignors of all classes. The Greenwich Exchange for Women’s Work incorporated in 1901 and later became a charter member of the Federation of Woman’s Exchanges in 1936. Many Exchanges have closed since then due to changing economic forces and expanding opportunities for women in the marketplace. The Greenwich Exchange, however, is still standing at 28 Sherwood place, but needs your support for its continuing mission. Please join us as a Member and/or a Volunteer, and/or Patron of our shop. With the start of summer finally upon us, more and more people are out walking and enjoying the warm sunny days in Greenwich. Central Greenwich is known for its excellent shopping, and it holds a hidden gem that some people might not notice on their walk to the Avenue. The Greenwich Exchange for Women’s Work is an organization of Women’s Exchanges. 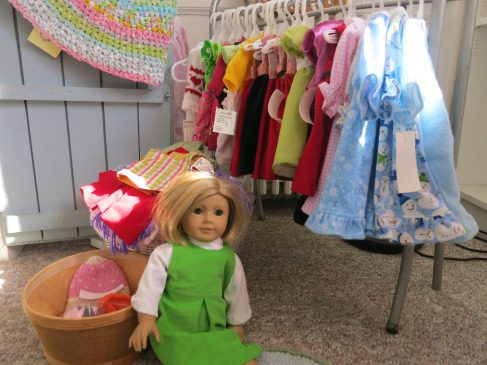 The non-for-profit groups help people achieve economic stability through the consignment and sale of their fine-quality, hand-crafted items. There are locations all over the country from New York and Connecticut to Florida and Missouri. The Greenwich location, located at 28 Sherwood Place, is in a great spot that has a homey feel with two floors of merchandise and a charming staircase. Over 200 artisan-consignors receive 67% of the sale price of their merchandise. The first floor consists of beautiful hand-woven baby sweaters from Argentina, booties, hats, blankets – anything baby, they’ve got it! 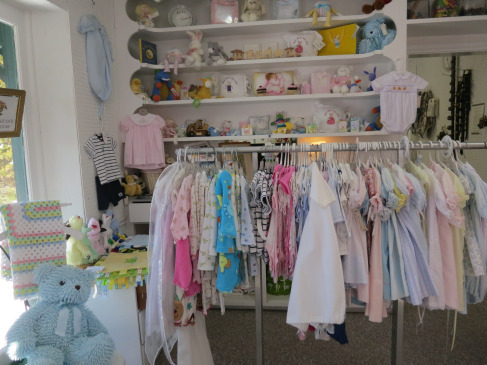 They also have kids’ clothing and women’s clothing, and little trinkets for the house as well. For example, there is a wall full of hand knit signs to hang on the door with sayings like “Kiss the Cook” or other fun household phrases. Upstairs is more of a home furnishings area, with these amazing towels that can be used for anything. “The beach, the bathroom, even taking them on the boat! They make a great gift,” says Tina Aronson, longtime employee of Greenwich Exchange. The Greenwich Woman’s Exchange has another hidden secret that few locations can brag about: their stunning Garden and Holiday Cottage in their backyard. (Garden in the summers, Holiday in the winters). This quaint little ivy-covered cottage is something out of The Secret Garden, and is filled with gorgeous consigned items such as tea sets and plates and needlepoint pillows. Stop by the Greenwich Exchange for Women’s Work to experience the magic of an organization that has helped millions of families throughout the years. From the Merritt Parkway, North or Southbound-Take exit 31, North Street. Follow the signs for the Greenwich Business District. Follow North Street to Rte. 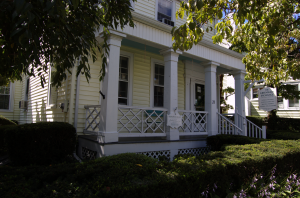 1 (Post Road). Make a right onto Rte.1 Follow Rte. 1 for approximately a third of a mile. Turn right onto Sherwood Pl. Greenwich Exchange for Women’s Work will be on your left hand side. From 1-95 North or Southbound- Take Exit 3, Arch Street.